In the dark and at room temperature, the dominant mode of photocathode emission is thermionic. The figure above shows the effect of temperature on dark counts for typical photocathode types, demonstrating that PMT photocathode cooling is highly advantageous in low level detection. This figure also shows that for standard photocathode materials there is little advantage in cooling below -25 °C. For this project we retrofitted the PMT probe that we described in Chapter 2 of our book “Exploring Quantum Physics Through Hands-On Projects” with thermoelectric cooling (TEC) modules. 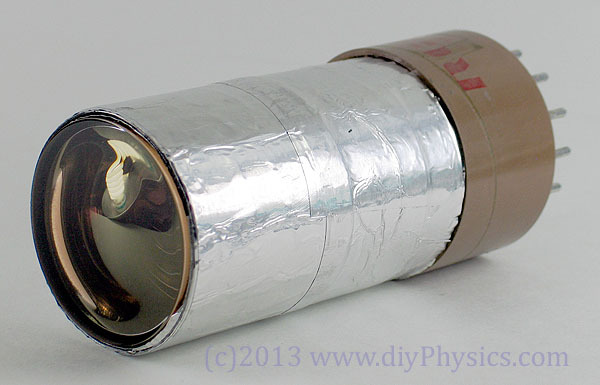 We started the conversion by tightly wrapping the PMT with CONETIC magnetic shielding sheet. The shield was held together with aluminum adhesive tape. The outer diameter of the shield was made to fit snuggly inside a Thorlabs XT66-100. Then, four 2-stage thermoelectric cooling modules were glued with Artic Silver epoxy adhesive to the Thorlabs XT66-100 construction rail enclosing the PMT. 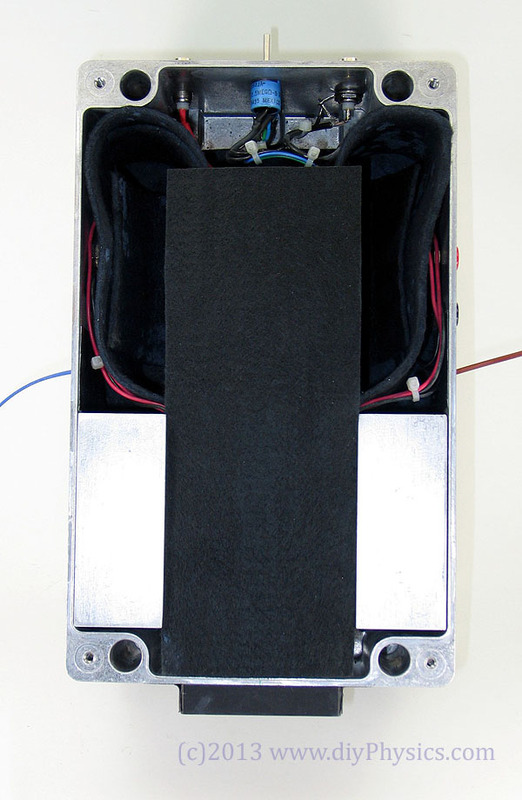 The hot sides of the TEC modules were glued with the same adhesive to two machined aluminum blocks that serve as thermal interfaces to the die-cast enclosure. 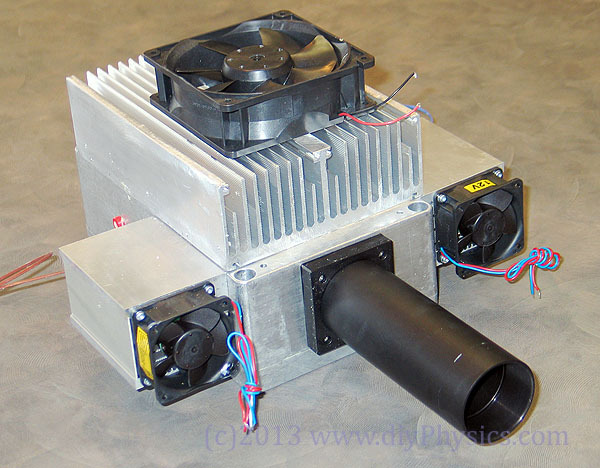 The PMT/thermoelectric cooling module assembly fits tightly inside the die-cast aluminum enclosure. Silver-loaded heat-conductive paste is used to ensure appropriate heat transfer between the aluminum blocks and the enclosure. we placed one K-type and one T-Type thermocouple in good thermal contact with the construction rail at the location of the PMT’s cathode. 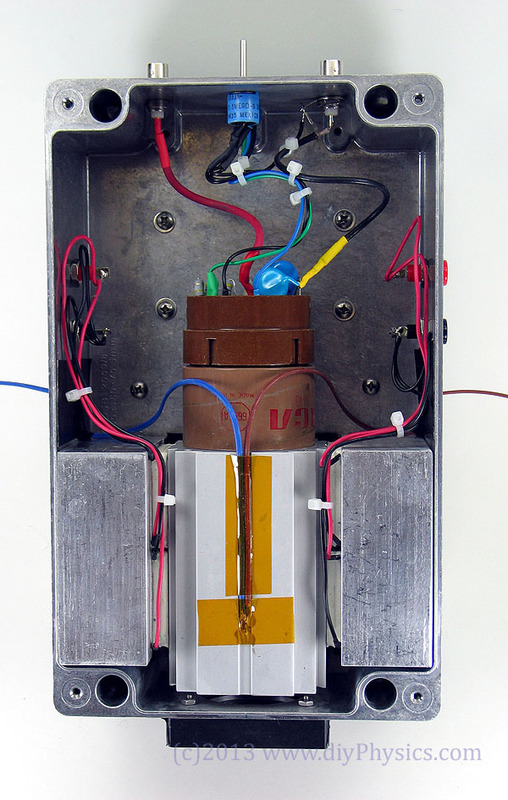 The thermocouples were held in contact with the rail using Kapton tape, and a dab of Artic Silver epoxy was used to ensure proper thermal contact. We used sheets of 0.079″-thick aerogel thermally insulate the PMT assembly from the aluminum blocks and die-cast enclosure. Lastly, we sprayed expanding foam insulation into all cavities prior to closing the enclosure. The figure above shows the effect of cooling on a RCA6655A PMT. 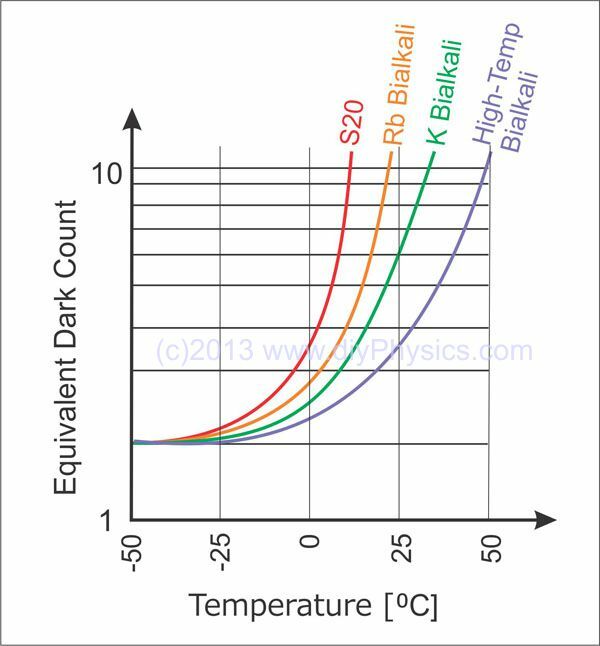 The dark counts due to thermoelectrons were reduced by an order of magnitude when temperature was reduced from ambient 23⁰C to -13.5⁰C. 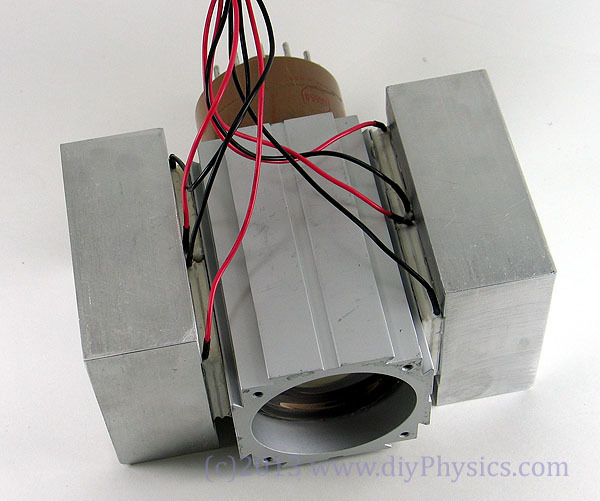 Although we believed that the design would provide effective cooling of the PMT, and were originally hoping that the large top heatsink and fan plus only two of the four TEC modules would be needed to cool the PMT to the target -20°C. That was obviously not the case, requiring the use of all four TEC modules, and the addition of two forced-air tunnel heatsinks to the sides of the enclosure to barely reach -13°C at a 23°C room temperature. Under ideal conditions with no heat load and in vacuum, the 2-stage TEC modules that we chose are capable of producing temperature differentials as great as ΔTmax= 83°C. The enclosure we built however is far from ideal, reaching a ΔTmax≈ 40°C. The difference between the ideal and actual performance is mostly the result of gradients that exist at the various interfaces between the photomultiplier and the heat exchange medium. In addition, there is also a heat load from dynode chain dissipation and an important amount of heat transferred from the housing case through the insulation. Tighter coupling between the TEC’s hot side and the heat sink. Use of a water-cooled heat-sink. Also, have you experimented with stacked Peltier modules, run at different voltages? I think it helps at least by increasing the distance between the cooled side and the heat dissipating side, less leakage through whatever you use as insulation there. This is interesting, I will be following this development, while digging out my related hardware, thanks for the re-inspiration! P.S. Custom machine your heat sink blocks, use mechanical pressure instead of that lousy epoxy, indeed use water cooling. This is not the first time that reality contradicts my guesses about heat flow inside an enclosure, and I now realize the many mistakes I made in this design. – “have you experimented with stacked Peltier modules, run at different voltages? I think it helps at least by increasing the distance between the cooled side and the heat dissipating side, less leakage through whatever you use as insulation there.” – Yes, the TEC that I used is a stack of 2 modules, but the way in which I used it didn’t take advantage of the potential increase in performance. I am currently working with Shanni on an APD-based SPCM for which we have a stepped stack of 4 TEC modules. We changed our enclosure design completely after the less-than-stellar results of my cooled PMT housing. – “That brings us to having the whole setup inside an aluminum case in contact with the hot side of the Peltier, maybe not a good idea… Have the hot sides stick out like engine cylinders on an old aircraft…” – Agree completely with you. The hot side really has to be in direct contact with the heat sink. The reason I did it this way was so that I could avoid breaching the enclosure and allowing photons to leak through. – “Custom machine your heat sink blocks, use mechanical pressure instead of that lousy epoxy, indeed use water cooling.” I did custom machine the aluminum blocks and used both large machine screws and artic silver. However, the loss through the blocks and interfaces is too large. The hot sides really need to be mounted straight on the heatsink. Great job! Did you ground the rail that houses the PMT? Be wary of those banana jacks – they don’t look like it, but they are a bit translucent – you can get some light through them. It’s most likely not a concern when you have the PMTs sensitive parts shielded like that though. Indeed, the plastic jacks leak light, so I back everything up with black Gorilla tape. From my experience – when using generic chineese peltiers, there is no use for 2 stages. 1 stage goes down to ~-17, and no improvement in dual stage setup. Peltier itself works poorly. I tried to cool it with -10C air, and still got same ~ -17C result. I tried to cool one side to -70 with dry ice, and peltier was unable to cool anymore at all. I guess true 2-stage setup must use peltiers made of different materials, they can go to -50C and below. I’m now playing with a stepped 4-stage Chinese TEC, attempting to cool an APD. The hot side is 4 cm x 4 cm and the cold side 1.5 x 1.5 cm. I’ll report on how this works out. Of course, cooling a tiny APD to -20C should be much, much easier than cooling a standard PMT. Experiments I’ve run using identical Peltier modules stacked suggest that the the hotter module is easily saturated by the output of the colder module. This makes sense as the output of the colder module not only includes the heat from whatever is being cooled, but also includes heat from the electrical power dissipated within the colder module. The hot module would need to be able to remove all the electrical power diving the cold module, as well as whatever heat the cold module removed.Bottom line, the hot module needs to have a Qmax greater than the power injected into the cold module, just to be worthwhile.I would also place the heat sink (liquid cooling? heat pipe?) in contact with the hot module, if possible.